Delhi never fails to fantasize people. It is not only the national capital of India but quoting it as the food capital of the country won’t be wrong. As there were many dynasties that ruled Delhi, hence the glimpse of the same could be found in the food of Delhi. Well, there are different cuisines that are worth trying in Delhi but the street food has its own significance and value here. If you are roaming across the streets of Delhi then don’t forget to try these street foods here. Your visit to Delhi would be incomplete without tasting the delicacies of street food here. Delhi has a vast variety of street foods and I must say that every street food is worth trying here. Well, the list is really long but to bring you the best, I am presenting here the street foods that must not be missed when you are on a trip to Delhi. So, here we go with the list. 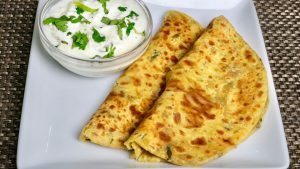 The first and foremost important street food in Delhi is Parantha of course and no one could take the pride from it. Whether you are a resident or a visitor, the moment you ask for recommendations on where to savor the best street food in Delhi, Chandni Chowk will be one of the most popular suggestions. Known for its old-world charm, Chandni Chowk is home to the famous paranthe wali gali where each shop serves up to 30 different kinds of paranthas. However, in other parts of city also you can try the crunchy Paranthas. Being ruled by Mughals, the flavour of Mughlai cuisine could be clearly felt in Delhi’s street food and Kebabs is the perfect example of it. A visit to old Delhi is incomplete without kebabs. Popularly known as the kebab town, the streets are full of shops and vendors selling all types of non-vegetarian delicacies. 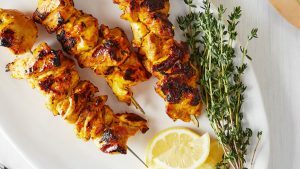 From Reshmi Kebab, made with minced meat and coriander to Kalmi Kebab – chicken legs marinated in yogurt and cream, there are tons of options when it comes to non-vegetarian street food options in Delhi. 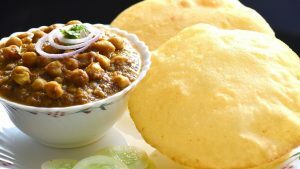 Delhi has a great influence of Punjabi culture and tradition, so Chole Bhature comes obvious out of it. If you haven’t tried the famous Chole Bhature, then you’ve missed out on one of the most vital experiences when it comes to the best street food in South Delhi. Bhature or fluffy bread made out of self-rising and wheat flour is a crowd-pleasing item from Punjab. Combine this with thick, tangy and spicy red gravy loaded with chickpeas, garnished with onion and coriander; and you’ve got a dish fit for the Gods. Served with a yummy tamarind sauce on the side, Chole Bhature is a heavy dish, so make sure you eat this on an empty stomach. Although it’s called a chaat, Daulat ki Chaat is actually a sweet dish. Made up of rich, creamy foam collected by churning milk, it is mixed with sugar and saffron then garnished with pistachios and almonds before serving. Heavenly to eat, this popular plate of goodness is as unique as it sounds. One of the most common and sought-after items when it comes to famous food items in Delhi, this dish is quite the favourite amongst many. Matar Kulcha is a healthier alternative for Chole Bhature. The recipe comprises of a flatbread made out of fermented dough and a white pea curry topped with chopped onions, tomatoes and coriander, and a generous splash of lime. This quick snack curbs hunger pangs and each new mouthful is more delicious than the previous. Indian food is a blend of perfect spices and if you are found of it the Chaat of Delhi would fill your appetite in best way. You know what is most fantasizing about Chaats in Delhi, you would find a complete variation in the same everywhere across Delhi. 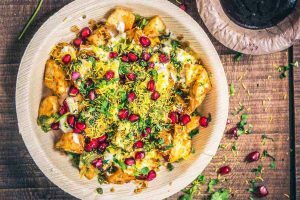 Simple, yet delicious, chaat is an umbrella term that encapsulates several favorite snacks like Aloo Tikki, Aloo Chaat, Dahi Papri Chaat, Dahi Bhalla, Papri Chaat, Samosas and Samosa Chaat. From a hot cutlet or tikki served with spicy sauces to a filling for samosas, potatoes are a staple street food ingredient. Gol Gappa is the synonym of street food in Delhi. Called as Panipuri in Maharashtra and Phuchka in West Bengal, this mouth-watering spicy water balls would quench your craving. 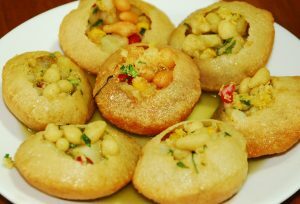 The Delhi Gol Gappas are stuffed with a spiced mix of boiled potato cubes, chickpeas and coriander and some sweet chutney after which they are dipped in chilled tangy flavoured water and served. Tiny and flavor-packed, Gol Gappas are something that you won’t be able to have just one of. Ram Laddoo is another interesting street food that you must try in Delhi. 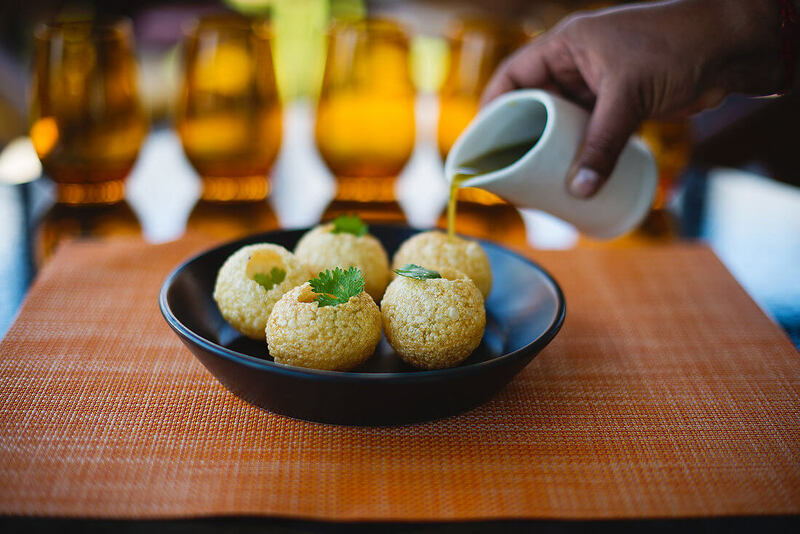 These soft, deep-fried balls are made out of split green gram flour and loaded with spicy green mint and shredded radish. This dish is available at almost every street corner and is considered to be one of the best street foods in every Delhi district from West to South. You’re not likely going to miss out on spotting a vendor frying fresh Ram Laddoos for their customers. These softballs of heaven melt in your mouth, with a spicy, tangy aftertaste, leaving you wanting more. A desi take on the ever-popular ice-cream, this sweet-tasting milky white frozen dessert on a stick is the perfect treat to stave off the hot and sultry weather of Delhi. Filled with nuts and saffron, and topped with falooda (vermicelli), this sweet dish is the perfect way to end a meal. This dish is one of the oldest and most popular items on the menu of Delhi street food. 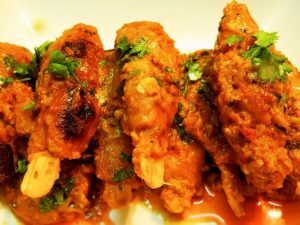 In the recent years, Delhi has seen a sudden increase in hawkers and vendors selling grilled and tandoori soya chaaps. Often known as a vegetarian alternative for mutton, Chaap is so exquisite, that it has become popular among the non-vegetarians as well. The variety is endless, from Afghani Soya Chaap, Tandoori Soya Chaap to even Malai Soya Chaap, this is one dish that you must not miss. Delhi has a vast variety of street food. But, along with street food there comes a concern of hygiene. I would recommend you to try the street foods at some hygienic places. Chaat Ka Chaska is one of the authentic places to try the authentic street foods from various parts of India. You would definitely get the authentic taste and favour here and that too without compromising with your health.